Calling all alcoholics out there! 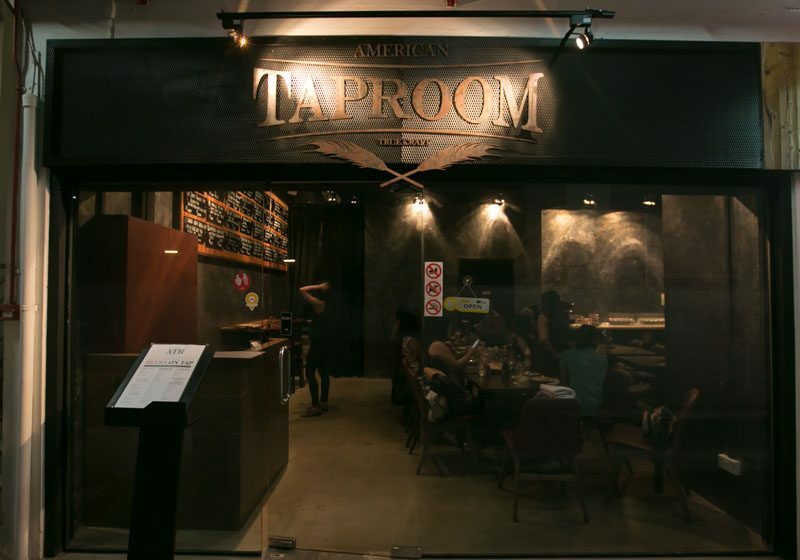 There’s a new bar in town tucked in a corner of Waterloo Centre, American Taproom will change the Singapore drinking scene. 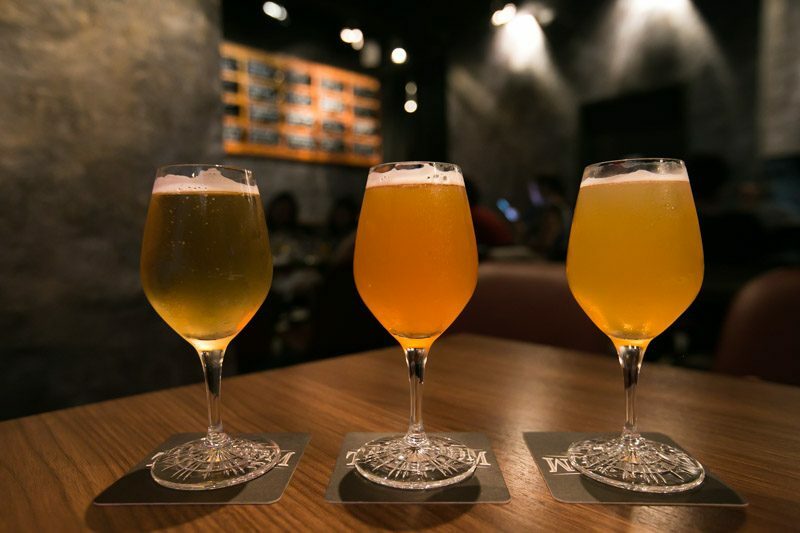 Say no to long waits for tables at the ever-full bars along Haji Lane, and hello to a new air-conditioned hideout. 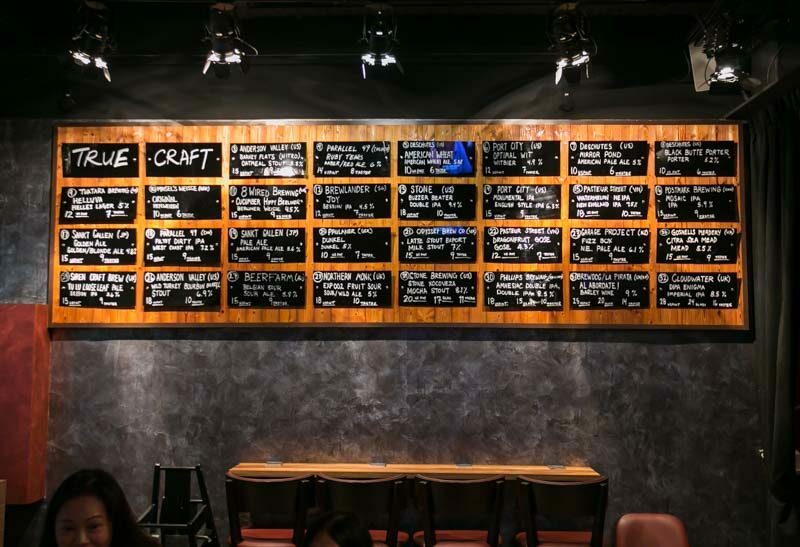 American Taproom caught our attention as they offer 30 beers on tap (yes, you heard me right — 30!). 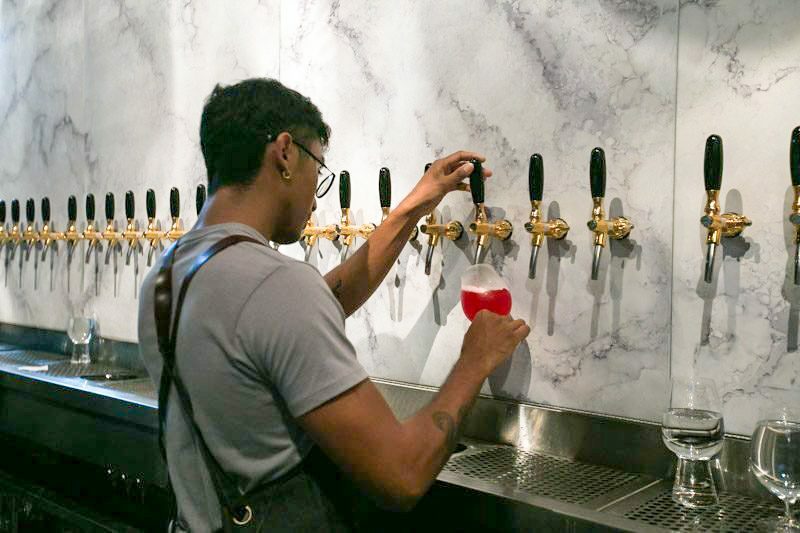 They offer the largest variety of crafts on tap from mead to stout, so fret not because you’re bound to love at least one of these. Take your pick and mix it up through the night. 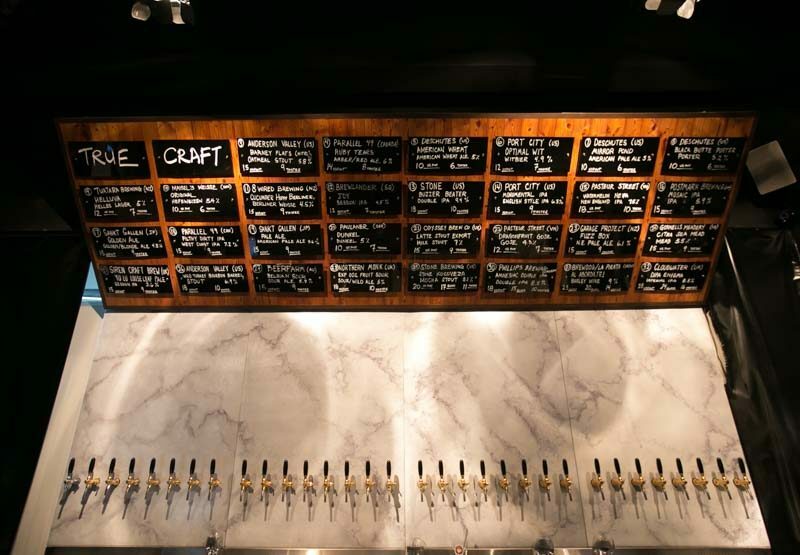 Try their tasters that range from $6 to $10 a glass, or get a full pint if you’ve found the new love of your life. 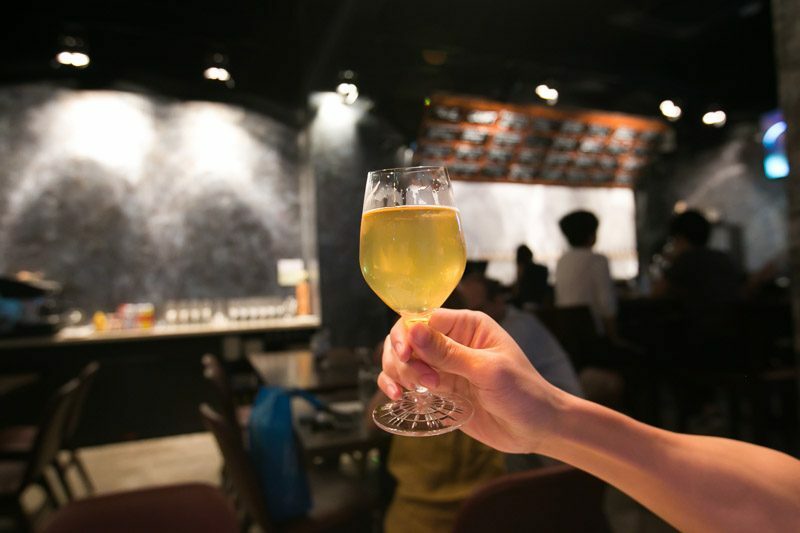 But one thing’s for sure — there’s bound to be a drink for everyone, beer-enthusiasts or not. Though I’m not a fan of stout, the Odyssey Brew Co’s Latte Stout Export ($9) definitely made me rethink any prior dislike. Sweet toffee notes lingered after every sip, negating the usual bitterness of stout, leaving a sweet sensation that reminded me of fudge (*licks lips*). Between Pasture Street’s Dragonfruit Gose ($7) and Postmark Brewing’s Mosiac IPA ($9), I can’t quite decide which I prefer. The former left my tongue tingling with a tanginess that cleansed my palette, ready for the myriad of food that was to come. The latter, on the other hand, highlighted a faint sweet-sourness that reminded me of passionfruit that was a pleasant contrast to the usual bitter aftertaste. My heart was torn between the two, but I’d recommend the IPA as it had a more complex blend of flavours (and the Gose stole my heart mainly due to its aesthetic appeal). 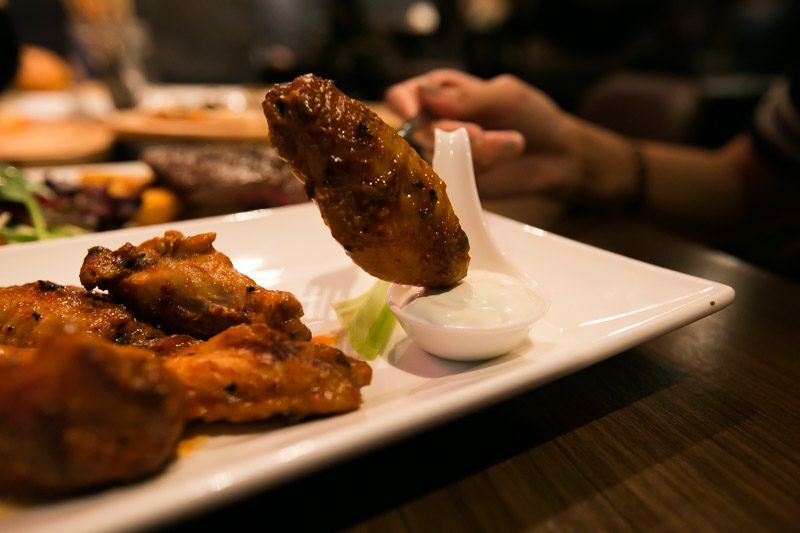 Drinking should never be done on an empty stomach and with Buffalo Wings ($12) being my go-to bar snack, I couldn’t resist trying their take on this classic starter. And I was not disappointed with this choice. 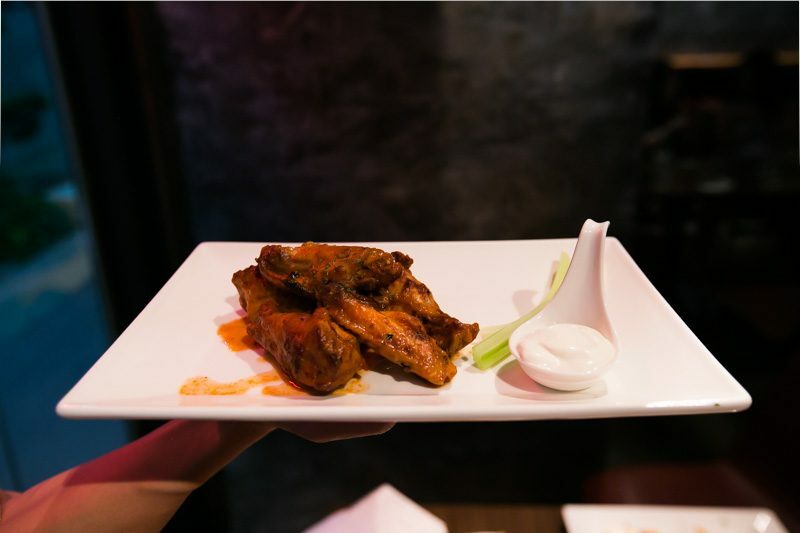 The tabasco covered wings were the right balance of sour and spicy, neither overpowering the other. For those whose spice tolerance stands on the lower end of the spectrum, you have not been forgotten. A dip in the blue cheese dip subdues the heat and offers an additional creamy element that gives the dish a new depth of flavour. The tartness definitely whets my appetite and I could not wait to see what the other dishes would bring to the table. 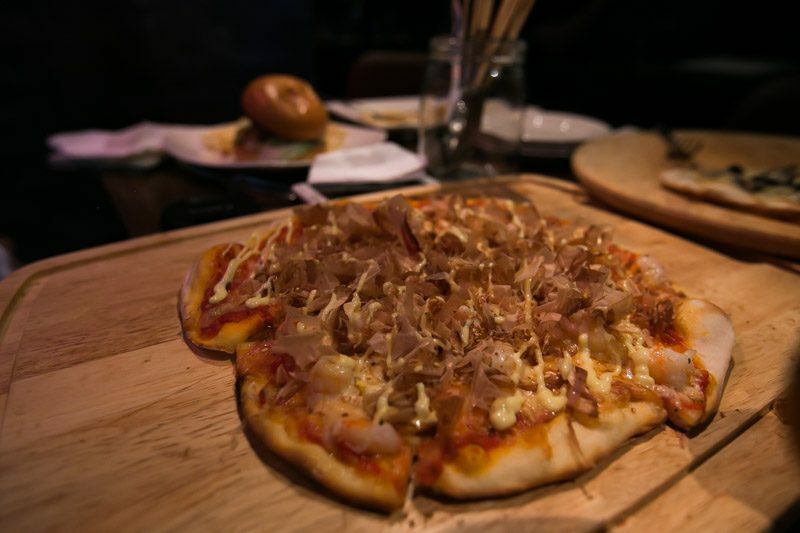 The Okonomiyaki Prawn Pizza ($20) reminded me of Takoyaki. Topped with yakitori sauce and bonito flakes and finished with a sprinkle of furikake, the familiar flavour brought me back to having those balls of goodness at pasar malams. 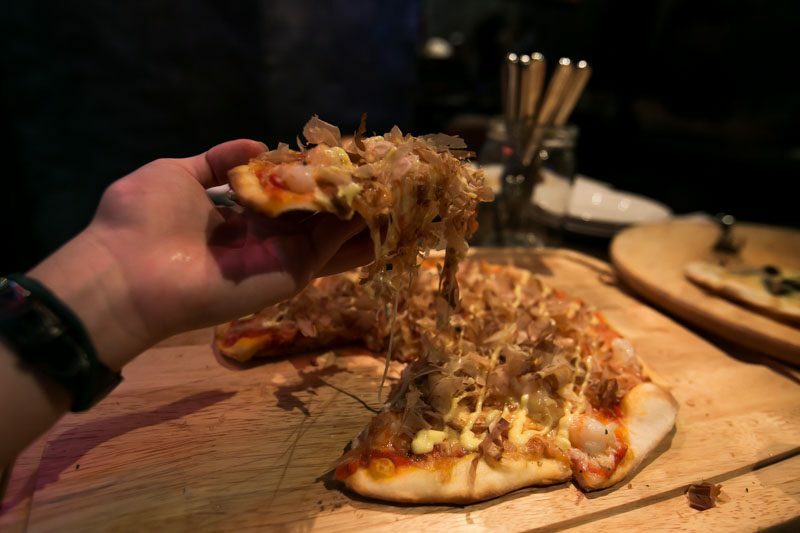 With generous servings of prawns and mozzarella cheese that sat atop a thin, crisp pizza base, the Okonomiyaki Prawn Pizza quickly won us over. The usual paiseh piece did not occur as we all but fought for the last slice. While the buffalo wings and pizza were good, it was time to wash down the flavours with more beer. 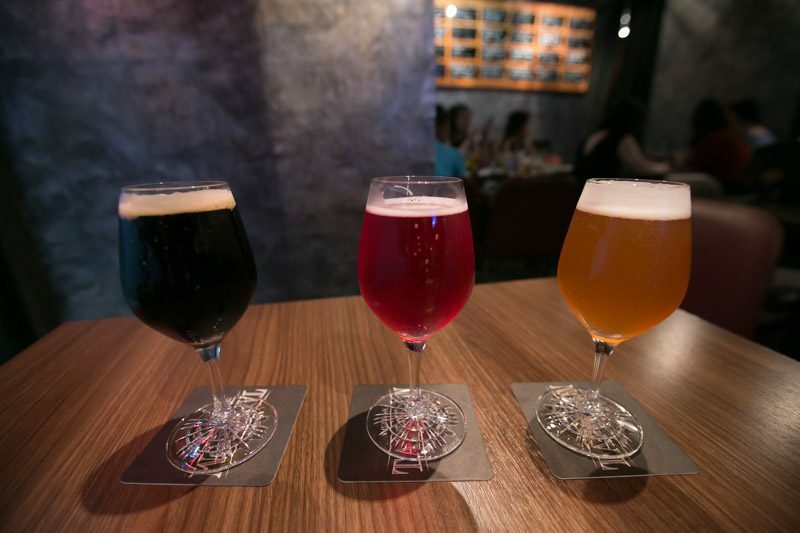 We got, from left to right, Siren Craft Brew’s Yu Lu Loose Leaf Pale Session IPA ($9), Stone’s Buzzer Beater Double IPA ($10) and 8 Wired Brewing’s Cucumber Hippy Berliner Weisse ($9). The Double IPA left a bitter aftertaste I did not quite like. I’d recommend the Pale IPA or Cucumber Weisse as a mid-meal pick me up, which had hints of yuzu and cucumber respectively, both were a refreshing palate cleanser. 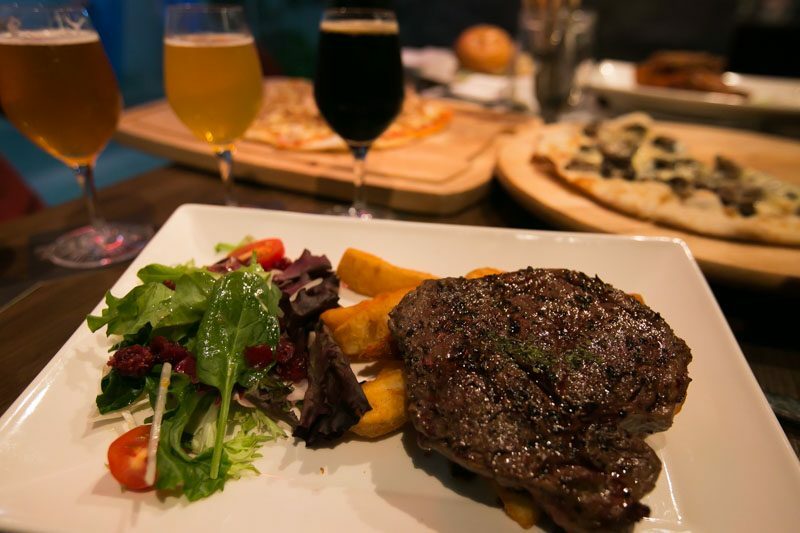 I’d never thought of ordering steak at a bar but American Taproom’s Rib Eye Steak ($28) changed my mind. For those who are not as steak-obsessed as I am, this might just be the dish to change your mind. Cooked medium rare, this piece of steak was juicy and melted in my mouth. 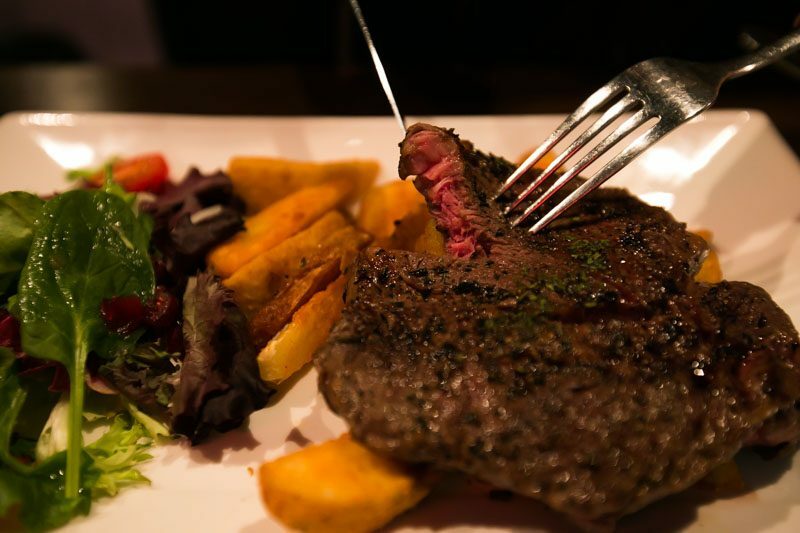 A mass of buttery decadence, we devoured the 200g steak in a matter of minutes. The seasoning masked the gamey taste without overpowering it, making it a quick favourite. 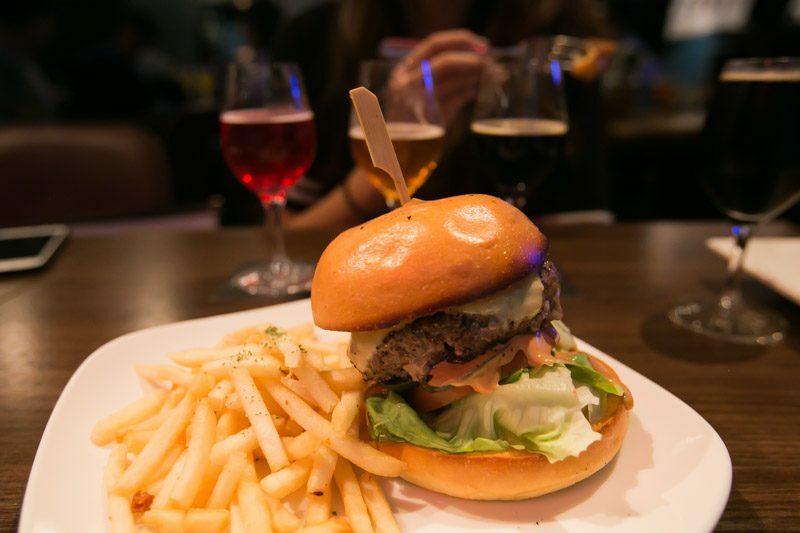 The ATR Burger ($16) paled in comparison to the other dishes we had and did not live up to our expectations. The minced beef patty was slightly too dry and the BBQ mayonnaise did little to add moisture to the otherwise dry burger. Hence, failing to make a lasting impression on us. After a night of delectable food that sat rather heavily in my stomach (although I’m not complaining), Gosnell Meadery’s Citra Sea Mead ($9) was the perfect drink to end the night. The honey and sea salt combination complemented each other (think a lighter version of sea salt caramel) and was completely free of the usual bitter aftertaste. Amongst all the craft beers we’ve tried, this was by far my favourite. But don’t just take my word for it. Head down to American Taproom to try it for yourself. Located at Waterloo Centre (a seven-minute walk from Bugis MRT, behind the National Design Centre), their grand opening will be held on 8 and 9 June 2018 from 12pm till midnight.